Wrap in paper first individually, then packed in bubble bags, finally put in standard export carton packing, or OEM packing. Ceramic Guide Substrates are used in many electronic applications where a thin insulating layer of thermally stable material is required to conduct heat away from electronic components whilst electrically insulating them, and material is 95%, 96%, 99% alumina and zirconia. Properties with excellent insulation, high mechanical strength, high thermal conductivity, low expansion coefficient, small dielectric constant, high-temperature resistance, excellent erosion and wear resistance, good quality in chemical shock heat and cold. Due to these outstanding properties, Ceramic Products are used in a wide range of industrial and advanced appications. And a lot of practical applications prove that our ceramic products has reached a state of high standard and quality. The ceramic guide plate / location - plate with holes and small screws. Zirconium Oxide Plate will be wraped in paper first individually, then packed in bubble bags, finally put in standard export carton packing, or OEM packing..
Mingrui has years of professional OEM experience in manufacturing industrial ceramic products. And very advanced technologies in the production of zirconia and alumina ceramic rod, ceramic tube, ceramic plate, ceramic ring, ceramic shaft, ceramic plunger, ceramic valve, ceramic sleeve, ceramic nozzle, and semiconductor ceramics, etc. They are applicable to Electrical, Appliance, Mining, Oil & Gas, Energy & Power, Food & Medical, Chemistry, Agriculture, Aerospace, even other high-end fields. We, an advanced technical team with 10 senior engineers,more than 80 technicians and 100 equipment machines, taking one-stop production, from the raw material (powder) to final products, control the quality of every production link well. Our high efficiency machined ceramic parts, perfect service and good reputation roots in our professional machined ceramic technology, continuous innovation, great sincerity and our pursuit for sustainable development. We have a unique technnology called "mirror polishing" that has improved the brightness, color, smoothness of our ceramic parts. Your advice and visit is our best welcome! Our products with some certificates, such as , CE, TUV, etc..
We carry out one-stop production, from the raw material ( powder ) to final products, control the quality strickly of every production link. 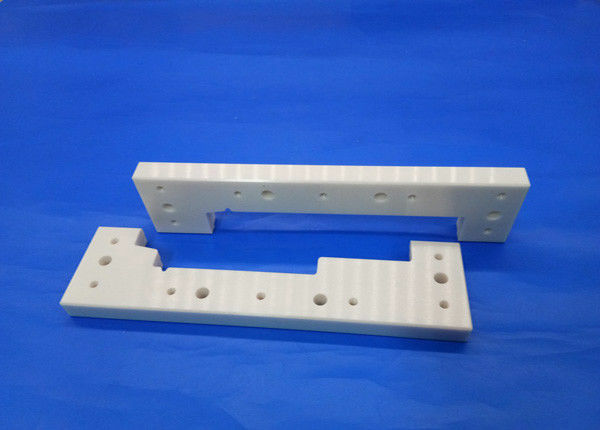 China Good Quality Machining Ceramic Parts Supplier. Copyright © 2016 - 2019 machiningceramicparts.com. All Rights Reserved.